Go to device manager and disable the PCIe x4 controller (there should be only one). This is the controller for the right side Thunderbolt ports. When not disabling it, you will probably get error 12 on both the internal dGPU and on the eGPU. Hotplug the eGPU after Windows has finished booting. If you plug it in before or while booting, it will cause both eGPU connected displays and your internal display to stay black. External displays of course work as expected. 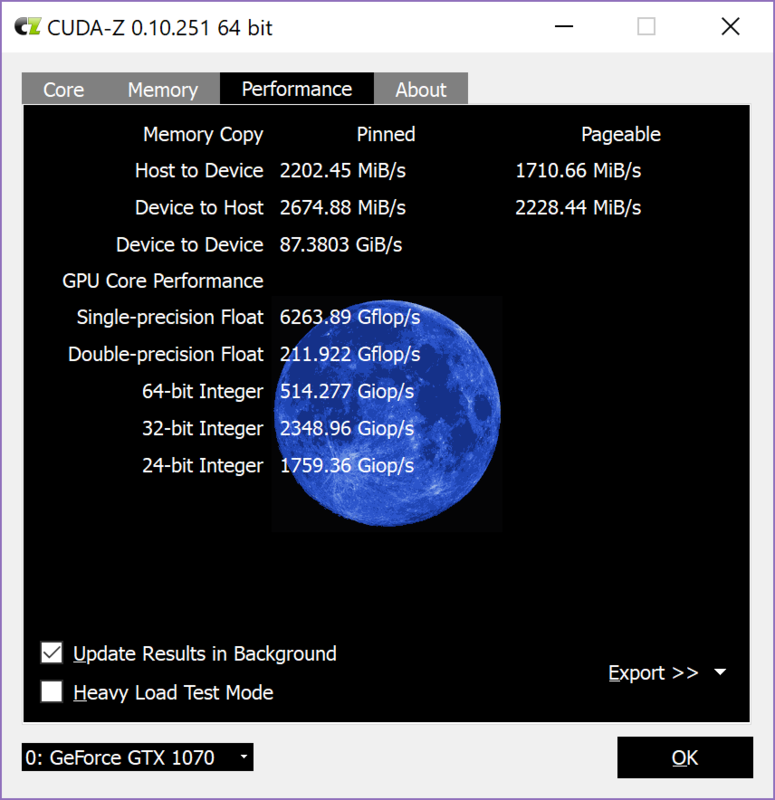 Scroll down, click "Graphics Settings"
Add the apps you want to use the eGPU for, and set them to "High Performance". 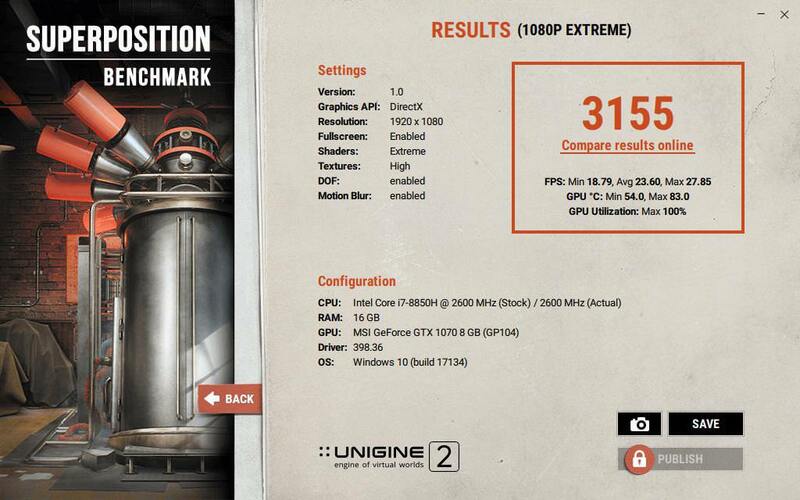 It should show your eGPU as the high performance graphics card, and the internal Radeon as the power saving one. 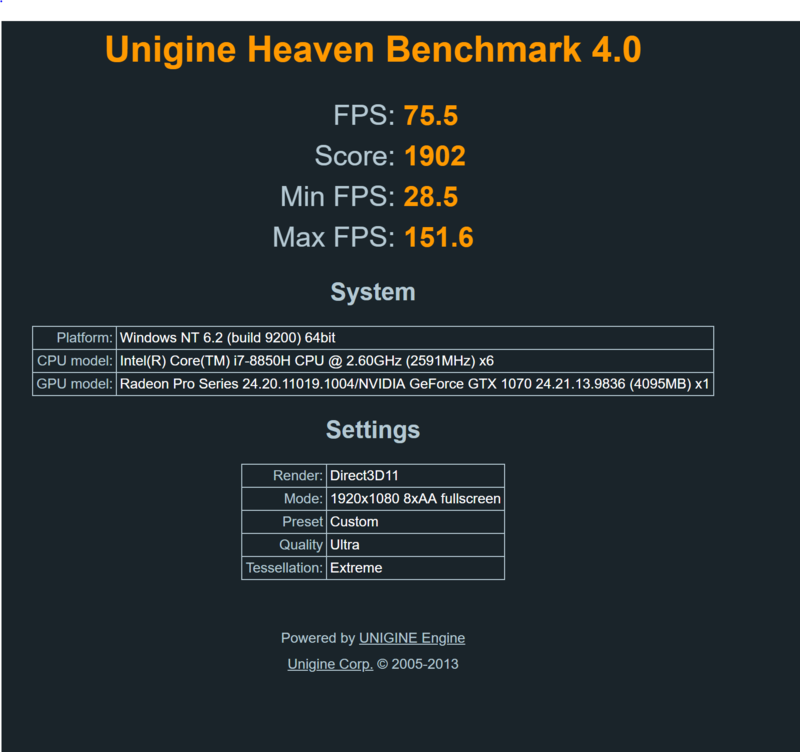 I did not yet perform benchmarks on the internal display. 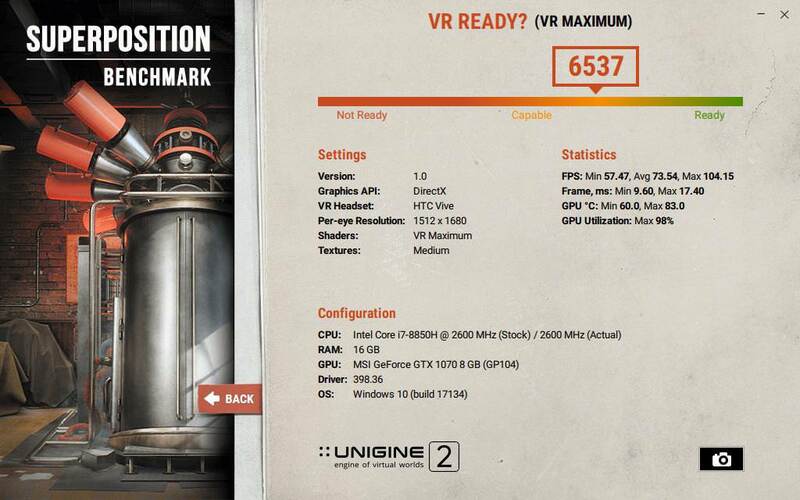 While general results look promising, I did not yet get a playable experience on the HTC Vive yet. This is a requirement for me to keep the eGPU instead of going back to a separate PC. While it does technically work, it is not what I would consider a great experience. There are stutters and an obviously enormous amount of reprojection going on. When reprojection is disabled, the result is totally unbearable. SteamVR also shows a lot of missed frame warnings. Any suggestions to improve the VR experience are very welcome. When connecting my keyboard / mouse to the left USB C ports, I experience stutters on the eGPU, no matter if I connect the eGPU to the right or left ports. That's why I connect my other devices on the right side and the eGPU on the left side. I did try to get the Intel GPU and eGPU to work using rEFInd with macOS spoofing, with no success. Even without a connected eGPU, booting Windows on the Intel GPU (using integrated.bat) just shows a corrupted display after boot before the display goes completely black. 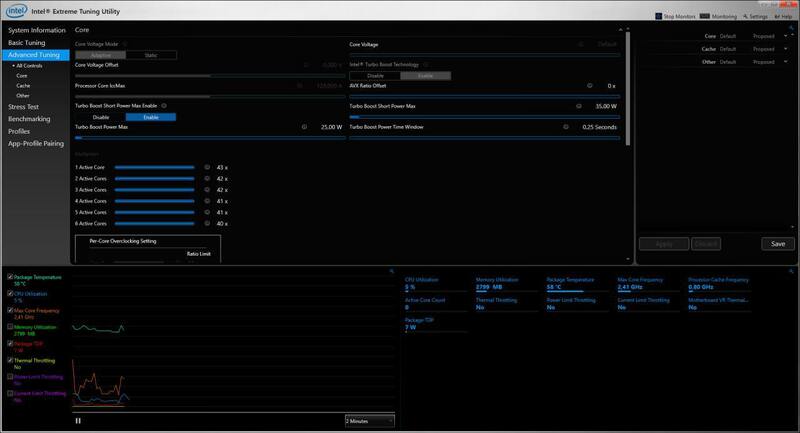 It would be nice to get the iGPU working as that would allow us to disable the Radeon, which probably generates more heat than the iGPU. Now we need a script to run in Windows to direct all apps to use eGPU and then a switch to set all to use dGPU when done. When I right click on the desktop and try and enter the Nvidia settings, I get a no Nvidia card attached to system error. i am using the same MBP with you, razer core x and RTX2060, i did the same settings with you, there is no error and im going tu use it on internal display. 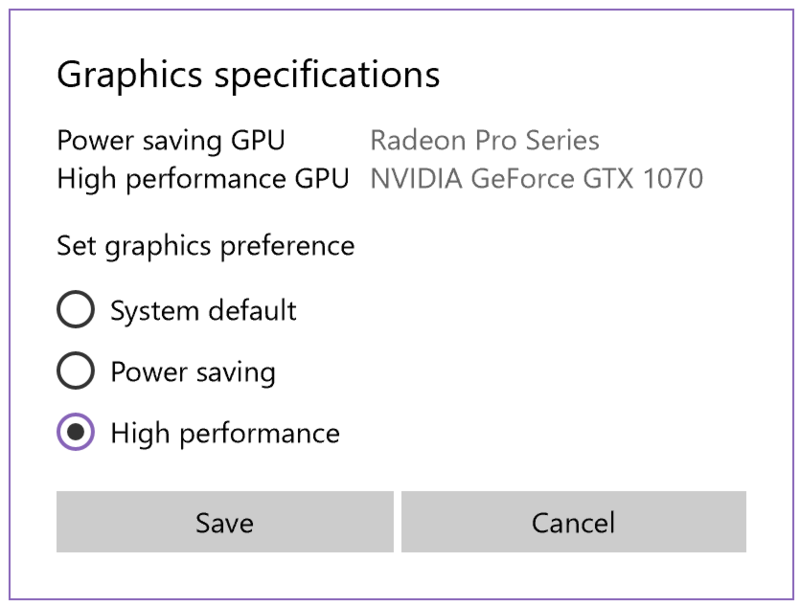 i have also did the settings in windows graphic settings but when i use this app, it use always the 560X, what should i do?